What Size & Shape will fit your room best? 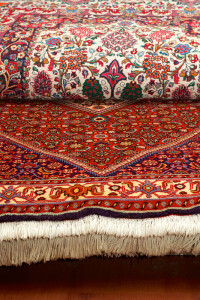 Rugs come in a number of different sizes, some of the more common include 2’x3’, 4’x6’, 5’x8’, 6’x9’, 8’x10’ and larger. They also come in round, oval, rectangular and square shapes. Keep in mind that with handmade rugs sizes are not always exact so bring a tape measure with you. If you are purchasing a rectangular or square rug you can simply measure out the rug size on the floor and use blue painters tape to mask off the corners of the proposed rug. Alternately you can use paper in the corners to determine the proper position and sizing of the rug which may be easier if you are still deciding on size. For round and oval rugs, use a piece of string from the center of where you would like the rug to sit. Secure the string with tape to your mid-point and use it like a compass to determine the overall circumference of the rug. If your design calls for the rug to cover the majority of the floor in the room then a good rule of thumb is to leave 12” to 15” of exposed floor around the room. This will allow for proper framing of your rug. Additionally, if the rug is to go under a dining table it should be large enough to allow for the chairs to stay on the rug while seated at the table. What Color will you choose? Determining the color of your new rug can be tough. The great thing about rugs is that you can use them to pull or accent specific colors within the design of your room. The right color selection of a rug can pull the whole room together. So when selecting your rug stick to one primary color and two additionally colors to accent your décor. What Pattern will you choose? You will have three options when choosing pattern – curvilinear, geometric and pictorial. Curvilinear is exactly as it sounds, it is curved lines. Geometric are rugs with patterns based on geometric shapes like squares, rectangles, lines, etc. Pictorial rugs, which are the least common, have images of people, animals and scenes. What Style will you choose? The style of rug that you choose is completely dependent on your personal tastes. The easiest thing to do when researching what you might like in your new rug is to bring pictures of what most appeals to you when you visit the rug dealer. They can then guide you towards the rugs that will best fit your individual style. Where will you get your rug? Now that you have narrowed down exactly what you would like, it is important to select a reputable dealer, especially when purchasing antique rugs. Your final selection of a rug should be guided by a knowledgeable rug counselor, as this will be an investment. If you choose not to purchase an investment then the knowledge above will help you find the best rug to fit your individual needs. When purchasing a rug consider the overall cost of ownership of your rug. All rugs have associated cleaning costs and the last thing that you want to do is hire an inexperienced cleaner to come in and clean you rug in your home. Rugs should be taken out of your home and cleaned in a plant type facility. Plenty of people have had the misfortune of selecting a cleaner based on price and ended up with rugs that have shrunk, lost color or have been significantly damaged by improper cleaning products. Avoid this by using a professional when cleaning your rugs. Delivery can also be a concern depending on the size of the rug that you purchase. Some retailers will deliver the rug and pad for you and lay them in your home, others may not. So it will be important to ask this question at the time of purchase. Finally, the most important thing is how you are going to pay for the rug. Some retailers may offer financing, so be sure and ask. You should also ask about the warranty and care guides for the rug as well.